Have you heard about our custom painted dog figurines? They are such a hit! Customers browse on our website, pick out the dog figurine they want us to customize, upload their photos and complete their order. We then custom paint the figurine they chose to match the photos they uploaded. Customers can choose from mini dog figurines, guardian angel dog ornaments, or our larger dog figurines. We ask our customers to upload at least 3 high quality photos to show all the details of the dog. The photos should show the natural coloring of the dog as well as all sides of the dog including their face and backside. Our latest custom painted figurine came out beautifully and made our customer so happy. She purchased the figurine as a Christmas gift for a friend. She was able to find a few great pictures of her friend’s dog, a Cairn Terrier. She uploaded the pictures onto our site when she bought the figurine and as soon as we received her order we got to work! Once we receive a customer’s order we review all the pictures they uploaded to make sure we can see all the details of the dog. We also have each customer answer a short questionnare which asks specific details about the dog including their nail and eye color. 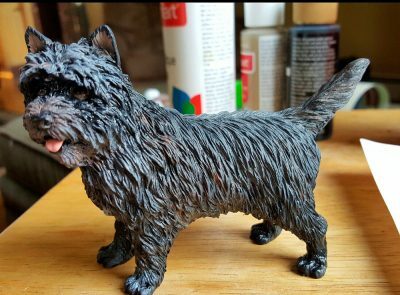 We have 3 pre-painted Cairn Terrier figurines available on our website, including red, gray, and brindle. Sometimes these figurines look just like our customer’s dogs and that’s why they purchase them. But sometimes customers have very unique colored dogs and that’s when our custom painted figurines are perfect for them! 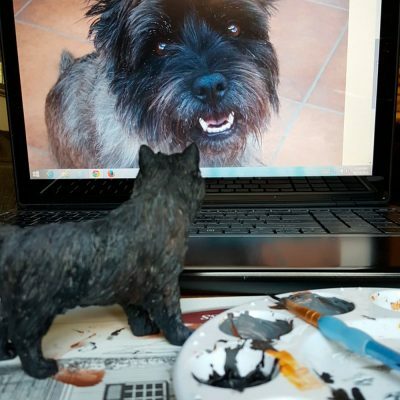 Our Cairn Terrier customer chose the color that looked closest to the dog she wanted custom painted, which was the brindle Cairn Terrier. Take a look below to see pictures of the painting process and a picture of the final product. Before we send out the figurines we take several pictures and send them to our customers to review. Sometimes they like us to add extra details around the face or paws of the dog. If they are satisfied with how the figurine looks then we finish off the custom painting process with a protective spray. Our customer who ordered the Cairn Terrier figurine gave us the go ahead to ship the figurine after she reviewed the photos we sent her. She was even more delighted with the figurine when she saw it in person. We love to hear positive feedback! Our customers tend to be pleasantly surprised with our figurines when they finally see them in person. Not only are they beautifully hand painted, but they are also great quality. They are made of solid resin and the coats and face of the figurine have extra detailing which adds a bit of realism. If you’re looking for a one of a kind gift for the dog lover in your life then consider a custom painted figurine! It’s a gift they won’t expect and that they won’t be able to find anywhere else!